The Iranian city of Isfahan stands for particularly fine and high-quality Persian rugs made by master knotters in this city. The city itself is centrally located in Iran, bordering the Zagros Mountains and the desert. Architecturally, the city has achieved high fame and popularity in the Islamic world. Especially the old bridge, the big Imam Square and the green parks stand out as highlights. The patterns and designs of many Persian rugs originating from Isfahan are based on the artistic elaboration of mosques, sophisticated tile decorations and Persian gardens. 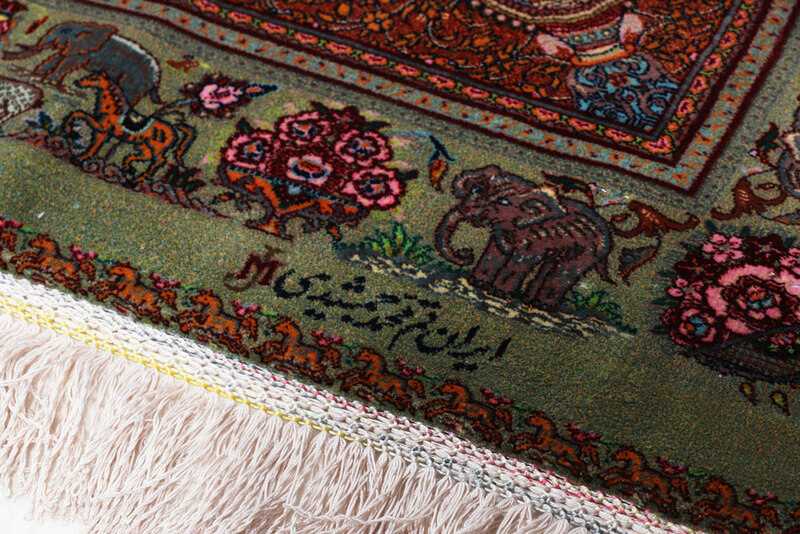 Some of the carpet studios and master knotters in Isfahan have achieved a worldwide reputation, such as Davari, Haghighi or Seirafian. Signed carpets by these masters not only guarantee outstanding quality and delicacy, but also a rarity that is worthy of preservation. Carpets by master knotter Akbar Mahdie, for example, are characterised by a knot density of 1.2 to 1.8 million knots per m2. Achieving such a density requires an extremely high level of effort, patience and skill, which is rarely available. In addition, the material is selected according to strict criteria so that only the best wool and pure vegetable dyes are used. Mahdie's signed rugs come from his studio, where he and his three sons produce Isfahan rugs of the highest quality worldwide. This city is known for its fine Persian rugs and is located in the north of Iran and has about 1.6 million inhabitants. Turkey, Armenia and Azerbaijan are not far from Tabriz, which was extremely important for trade until a few decades ago. Highlights of the city and the surrounding area are the blue mosque, the statue of the famous poet Khaqani and the colorful mountains in front of the city. 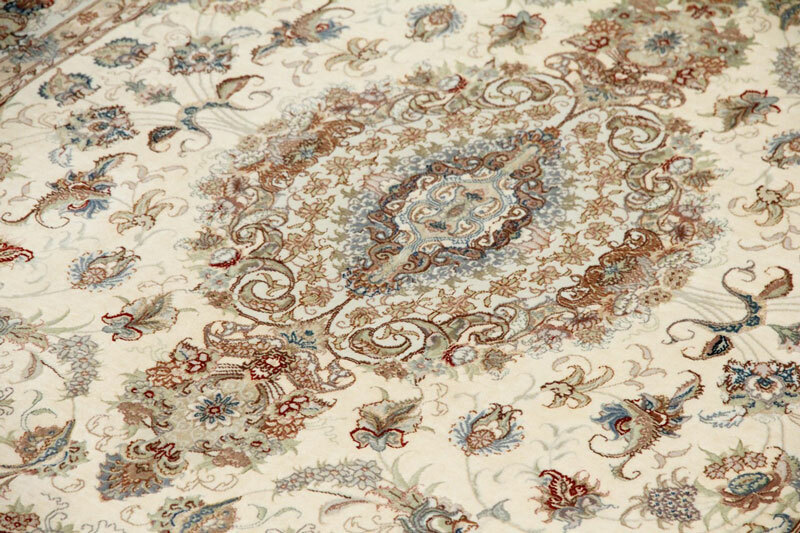 Most Tabriz carpets have a central medallion surrounded by floral ornaments and motifs from Persian gardens. Since the city has a long culture of poets and artists, carpets might also have an excerpt of a verse instead of a signature on their surface. Tabriz rugs with 70 Raj (1,000,000 knots per m2) or higher are already rare, even more so if they have been made and signed by one of the city's famous master knotters. Today,Shifar, Nezam, Idjadi or Alabaf for example, are well known as masters of Persian rug knotting. The probably most famous master knotter from Tabriz is Haji Jalili. His rugs have become extremely valuable collector's items and can hardly be found on the rug market. The situation is similar with old masters such as Djavan and Torabi. The most luxurious Persian silk rugs come from this city. The Iranian city lies approx. 150 km south of Tehran at the river of the same name, the Qom with a dried out river bed. As an exception, this town itself has no far-reaching tradition in carpet knotting. The first knotters came from Kashan to the city in the 1930s and started their existence here. After the first years of adapting motifs and characteristics from other carpet regions on the Qom carpets, they have now established their very own style. Today the silk rugs from Qom are known all over the world because of being among the finest and highest quality rugs available. For example, many master knotters don't produce with less than knot density of 1,000,000 knots per m2 and draft the finest works of art from pure natural silk and plant dyes. Although such luxury rugs are considered to be extremely valuable, the natural silk and the dense knotting allow the carpet to be laid out carefree at home. In addition to silk rugs, they also produce extremely high-quality wool rugs by master knotters in Qom. These often habe elaborate details made of silk. In addition, some of the rugs are knotted from rare cork wool. Some of the most famous masters from Qom are Jamshidi, Erami, Kazemi, Mohammadi and Djeddi. Works of them are mostly designed with birds, flowers and other garden motifs as well as sophisticated mosaic patterns and were signed by the master knotter. Nain is a desert city in Iran and lies in the centre of the country. 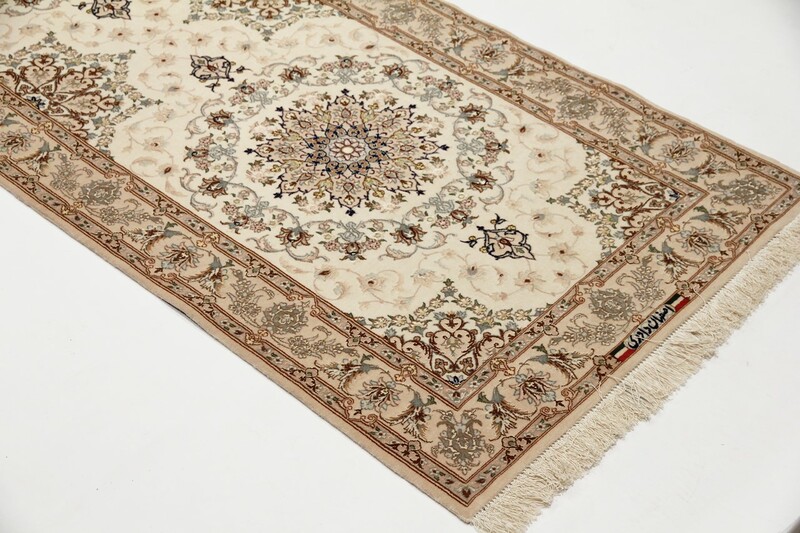 The rugs knotted here have clear characteristics that differ from rugs from other regions. Almost without exception, they have a central medallion surrounded by floral ornaments. The most common colours are red, blue, black or green combined with beige and grey. When it comes to master knotters from Nain, you are going to find the name Habibian. 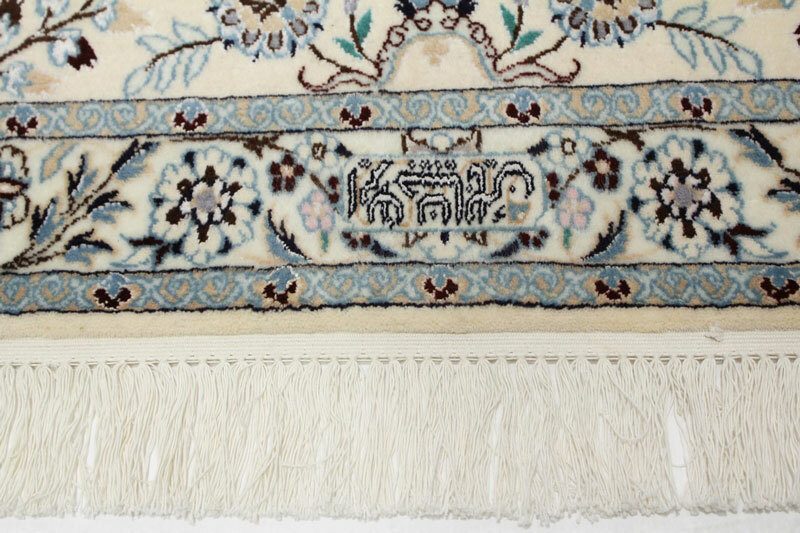 Fathollah Habibian is considered by many to be the father of Nain rugs, he has created a quality and a richness of detail that is hardly achieved today. In the 1920s, he and his brother started knotting Nain carpets. In 1995 Habibian passed away at the age of 92. Today his rugs are extremely rare and one runs the risk of encountering Nain rugs with imitated signatures. Genuine Habibian rugs have a more curved knot style (Duktus) than other rugs. Also, they exist only in 4La or 6La qualities, which means they have at least about 1,000,000 knots per m2. At the edge of the great Dasht-e-Kawir desert and south of Tehran is the old town of Kashan. Already in the 16th century this city experienced a golden age of rug trading and weaving. It is said that this was also the first time that natural silk was used in production and the knowledge was later brought to Qom by merchants. Kashan rugs, which were once considered to be the most highly regarded Persian rugs, have lost some of their fame and quality over time. However, unique pieces by famous masters are extremely high quality collector's items, such as those by Mohtesham. His rugs can now be admired in museums and private collections. Here you find examples of exclusive Persian rugs which are particularly fine in their knotting and are made by master knotters in a density of approx. 1,000,000 knots per square meter. Such rugs take more than a year to craft for a single very experienced and skillful knotter. Therefore, they have a rarity value.